The European Central Bank sets out recommendations for mobile payments services, the CEO of Kopo Kopo explains how his company has enabled 10,000 Kenyan merchants to accept M-Pesa mobile money payments in their stores, and how ex-Google Wallet execs are set to bring Amazon-like customer awareness to brick and mortar stores. 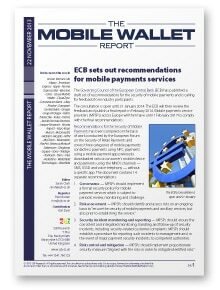 European Central Bank sets out recommendations for mobile payments services: The industry has until the end of January to provide feedback on a draft set of 14 recommendations for how mobile payments services should be managed in Europe. Mobile money moves to the point-of-sale: Dylan Higgins, CEO of Kopo Kopo, explains how his company has enabled 10,000 Kenyan merchants to accept M-Pesa mobile money payments in their stores and Serigne Dioum, head of mobile financial services at MTN Group, discusses a deal with Visa that will enable its 14m mobile money customers to make payments at any Visa merchant. Ex-Google Wallet execs get backing to bring Amazon-like customer awareness to brick and mortar stores: Jonathan Wall and Marc Freed-Finnegan discuss their vision for a retail platform that gives merchants a way to individually welcome customers and tailor the in-store experience to their needs. PLUS: Macy’s tests Bluetooth beacons with Shopkeep, Alipay moves to the point of sale, eBay unveils shoppable touchscreen storefronts, Apple Stores prep for iBeacons, and more. Organisations mentioned include Accion Venture Lab, Alipay, American Express, Apple, Aroma Espresso Bar, Barclays, Cako, Cause Mobile Wallet, CloudZync, Constelacion Bank, eBay, Etisalat, European Central Bank, Google, Grupo Prologix, Harris Interactive, Index, Intime, Javelin Venture Partners, Juniper Research, Khosla Impact, Kopo Kopo, Macy’s, McDonald’s, Mobinil, Mozido, MTN, MyCheck, Neurowear, PayPal, Rebecca Minkoff, Safaricom, Shopkeep, Square, Sony, TeleSign, Textlocal, Toms, Visa, Vodafone, Waterfield Technologies and Westfield.